Set against the backdrop of the thirteenth century, a time of chivalry and crusades, troubadors, knights and monarchs, Four Queens is the story of four provocative sisters—Marguerite, Eleanor, Sanchia, and Beatrice of Provence—who rose from near obscurity to become the most coveted and powerful women in Europe. Each sister in this extraordinary family was beautiful, cultured, and accomplished but what made these women so remarkable was that each became queen of a principal European power—France, England, Germany and Sicily. During their reigns, they exercised considerable political authority, raised armies, intervened diplomatically and helped redraw the map of Europe. Theirs is a drama of courage, sagacity and ambition that re-examines the concept of leadership in the Middle Ages. Nancy Goldstone has written and coauthored several books, including Four Queens. She lives with her husband and co-author Lawrence Goldstone in Westport, Connecticut. "A wonderful book about four remarkable women . . . An utterly compelling read." "A densely woven narrative of sibling rivalry, simmering resentments, and thwarted ambitions. . . . Times change but not, it seems, sisterly love." "Remarkable . . . told with all the verve and aplomb and richness of detail that four such extraordinary women deserve." "Goldstone weaves a vivid tapestry worthy of her subjects." 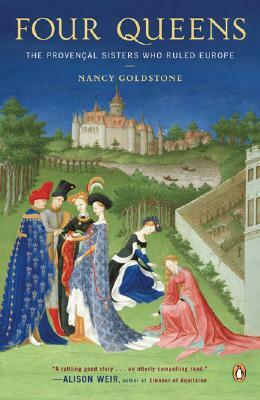 "On Goldstone's rich, beautifully woven tapestry, medieval Europe springs to vivid life. . . . This is a fresh, eminently enjoyable history that gives women their due as movers and shakers in tumultuous times."